The facade leads to the rectangular mukha mandapa which is 6.92mts length in north-south and 2.05mts width in the east-west directions. The sanctum is cut on the back wall of the mandapa and niches are formed on the lateral walls. On the back wall of the mandapa in the middle, sanctum is formed projecting 0.41mts in the south, 0.49mts in the north and to a width of 4.32mts inside the mandapa forming the anterior wall of the sanctum. The height of the mandapa is 2.55mts. Both the niches are formed in the centre of the northern and the southern walls of the mandapa. 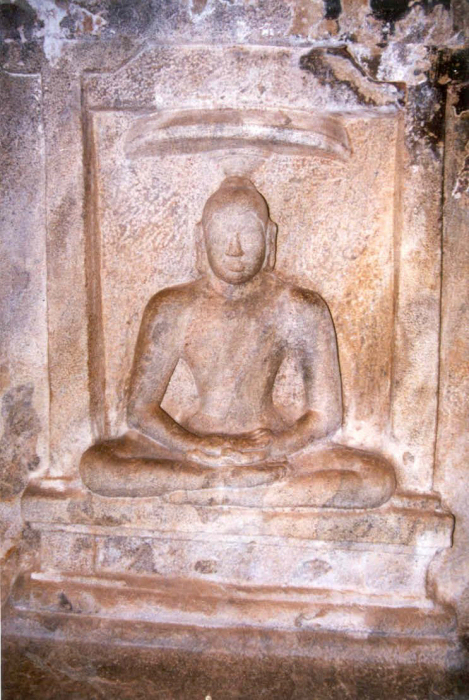 The niche on the north is projecting 0.12mts and the niche on the south 0.24mts inside the mandapa. The northern niche is formed little inside to the alignment of the northern facade pilaster whereas the southern niche is projecting equal to the length of the southern pilaster. The niches possess an adhishthana, brahmakanta pilasters flanking the niche and potikas above the pilasters. The potikas are plain angular extending the limbs on both the sides to bear the uttira of the mandapa. The uttira and the vajana on the lateral walls adjoins the same on the facade and back wall of the mandapa on either sides. The northern niche is 1.40mts height, 1.15mts width and 0.16mts depth housing a Jain monk. The adhishthana to the niche is formed to a height of 0.59mts and to a width of 1.84mts which carry the features of jagati, rudra kumuda, kantha with pada flanked by kampa, pattika and uparikampa. Here the upana is absent. Parsvanath, the 23rd Thirthankara adorns the southern niche which is 1.50mts height, 1.03mts width and 0.19mts depth. The adhishthana of the niche is 0.58mts height and 1.48mts width of which carry the features of padabandha basement viz., upana, jagati, rudra kumuda, kantha with pada flanked by kampa, pattika and uparikampa. The floor of the mandapa is well finished but at present damaged and uneven. 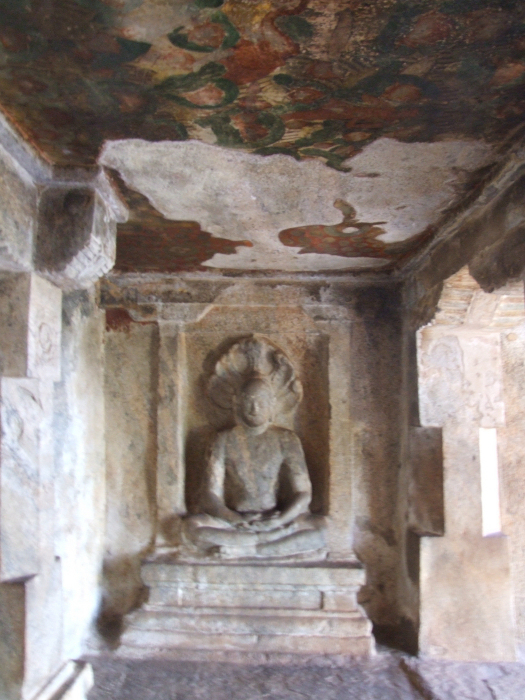 The roof of the mandapa is adorned with the famous Samavasarana painting. The anterior wall of the sanctum has a upapitha with the components of upana, kantha with pada flanked by kampas and peruvajana. The uparikampa forms the upper most component of the upapitha. Above the upapitha raises the wall sectioned by four pilasters. The pilasters are square-kattu-square in which the upper squares possess lotus medallions inscribed inside square frame. The kattu is long comparing the squares and also the facade kattu. Above the pilasters rests the potikas which are angular, taranga and patta. The corner pilasters possess potikas on its three sides extending both on the north and south and also towards west. The entrance to the sanctum is formed between the middle two pilasters whereas the space between the pilasters on either side remains plain. Three rock cut steps flanked by parapet wall are formed to the entrance in which the lowest step is formed as chandrakal. The parapet wall is protruding out from the mouth of the simha which form a scroll at its tip. The entrance has rock cut door frames of sill, jambs and lintel. The aperture is 0.78mts between jambs and 1.65mts height. The potikas hold the uttira and a thin vajana buffer the uttira and the roof. The sanctum is 2.93mts in the north-south and 2.84mts in the east-west directions. It is 2.14mts height. On the back wall of the sanctum a niche is formed 0.90mts above the sanctum floor to a height of 1.19mts and to a depth of 0.08mts and to the entire stretch of back wall. The niche houses the bas-relief sculptures of three monks. In the centre of the sanctum traces of circular marking is seen, it suggests that some circular object is removed from the sanctum which left with a scar of a circular trace. Above it a bas-relief lotus medallion is seen with a bud in the centre. 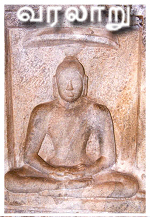 Parsvanath in the southern niche is seated on an oval shaped pitha in ardhapadmasana with his right leg placed over the left leg and hands in dyan mudra with right hand placed above the left hand. The thumb of the right hand is folded inside. Ears are elongated and head shaven. A five hooded snake is shown above his head spreading its hood widely. Eyes and throat of the cobra are well shown. The monk in the northern niche is also seated in ardhapadmasana with his hands in dyan mudra. The thumb in the left hand is broken. He is shown with single harmiya and the shaft extending behind the monk. The monk is shown with elongated ears. For both the monks the facial features are not clear, much worn out. 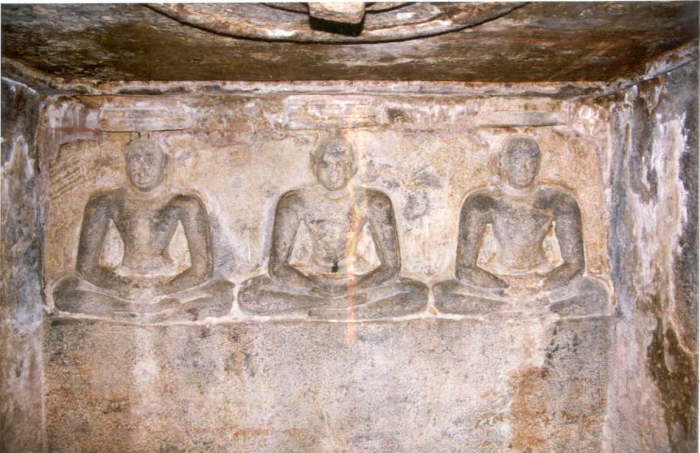 All the three monks are seated in ardhapadmasana on the floor of the niche with their right leg placed above their left leg and their hands in dyan mudra. For the middle and the northern monk three layers of chatras are shown denoting them as Thirthankaras, while the monk on the south is shown with single layer of chatra denoting him an acharya. For all the three monks ears are not elongated as shown for the monks of the mandapa. Besides among the sculptures of mandapa and sanctum, the former are well-formed whereas the latter are docile which denote both belonged to different period. 3. Such feature is also seen at Sathyagiriswara of Thirumeyyam. 4. Such feature is seen at Okkaliswara of Malaiyakkoil and Sigaripalleswaram at Melaicheri above the Linga.